Yesterday we told you that a rumour claims the Sony Ericsson Xperia PLAY and Xperia arc are set to be available for Rogers subscribers starting on April 28, and now that is already official as the Canadian carrier broke the news during a party dedicated to the event. 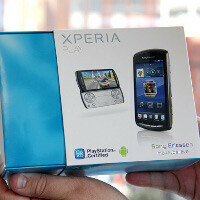 The beautiful Xperia arc and the Xperia PLAY, which is said to have (creepy ads alert: the links to the Xperia PLAY promos are here and here) everything you need and the one thing you want, are to be launched with a contract price of $99. As you surely know, the regular contract in Canada is three year long, so it's only right to tell you that the contractless price for these phones is expected to be $549, although that's not officially confirmed. You can pre-order the Sony Ericsson Xperia PLAY and the Sony Ericsson Xperia arc from the source link, while you can also take a look at the launch party of these handsets thanks to the videos below. SE your playing with fire here. I'm going to pick this up for Verizon supposedly on the 28th but i'm telling you if they announce the Bionic or the SGS2 with a May release date before that time you lost the fish you almost reeled in. Can't believe i said that Lol.